BOULDER,Colorado ? NASA?s sharp-shooting Kepler spacecraft is ready to take its placethis week in the pantheon of planetary detection technologies. It wasn?tlong ago when a question mark loomed over astronomers pondering whetherother planets existed beyond our little family of solar systemworlds. Today, nearly330 exoplanets have been discovered in the past 15 years - most of which aregas giants with characteristics similar to Jupiter and Neptune. It?s alittle out of the astronomical limelight, but there are those that see planethunting as a ?space race? ?a worldwide competition to findother Earths circling their respective stars. In earlyFebruary, it was announced that the French COnvection ROtation andplanetary Transits(CoRoT) spacecraft had discovered the smallest exo-planet yet, and with a surface to walk onto boot, albeit blazingly boot-melting hot. COROT-exo-7b is thetiniest terrestrial planet ever detected outside the Solar System andorbits a sun-like star. ?CoRoT is an excellent mission?acomplimentary mission to Kepler,? explained William Borucki, Kepler?s scienceprincipal investigator at NASA?s Ames Research Center at Moffett Field, Calif.
Those usingCoRoT have found that many of the stars they?ve surveyed are more variable thanexpected, Borucki noted in a February 19 NASA press briefing on Kepler. ?So it?sgoing to be harder for us to find some of these planets. That?s one of the reasonsthey haven?t found as many planets as they had hoped for at this time,? Boruckisaid. Still, the CoRoT team remained confident that their spacecraft will findmany more planets, he added. 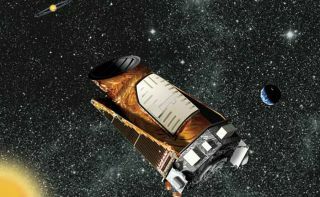 Now it?sshow time for NASA?s Kepler, which is setfor a late-night liftoff on Friday, March 6. It is billedas the first mission with the ability to find planets like Earth - rockyplanets that orbit Sun-like stars in a warm and cozy zone where liquid watercould be sustained on the surface. Liquid water is viewed as crucial for theformation of life. ?The CoRoTmission continues to provide surprises with its latest discovery of a hot superEarth with a 21-hour orbit. The Kepler mission looks forward to thechallenge of being the first to find an Earth-size planet in the habitable zoneof another star,? Borucki advised SPACE.com. There are ahost of differences between the two spacecraft. The CoRoTmission, along with its planet finding skills, is also designed to detect the subtle variation in astar?s light, caused by sound waves rippling across the surface. By doing this,CoRoT will gain a detailed insight into the internal conditions of the star.This technique is known as asteroseismology. For the $600 million Kepler, thereis one goal: finding Earth-size planets inthe habitable zone of sun-like stars. CoRoT launched in December 2006 andin the last two years has led to the discovery of six giant planets and the recentclaim of a terrestrial planet in a 21-hour orbit with a diameter about 1.7times that of the Earth. More discoveries of hot terrestrialsize planets larger than the Earth are expected in the coming years. However,because of CoRoT?s small aperture and because it can only look at a starfield for five months before turning to another, it is not expected to discoverEarth-size planets in the habitable zone. Kepler, meanwhile, is specificallydesigned to discover dozens of Earth-size planets in the habitablezone and hundreds near the habitable zone. A comparison of Kepler toCoRoT shows that Kepler has a 95-centimeter aperture, a field of view of100 square degrees, 42 detectors, and monitors a field of view long enough tofind planets with periods as long as 1.5 years. For CoRoT, it has a 27-centimeteraperture, a field of view of four square degrees, and two detectors forplanet finding, and monitors a single field of view long enough to find planetswith periods no longer than 2.5 months. At the ready to dive in on Kepler?sfindings is James Kasting, a professor of geosciences at Pennsylvania StateUniversity in State College, Pa. One of his space specialties is assessinghabitable zones around stars and the search for extraterrestrial life. ?I?m thrilled that Kepler is aboutto launch,? Kasting told SPACE.com. Kastingspotlighted CoRoT?s recent finding of a super-Earth - about two Earth diameters- circling a Sun-like star and having a surface temperature in excess of 1,500degrees Celsius (2,700degrees Fahrenheit). ?Kepler, ifit works, should find Earth-mass planets orbiting at one Astronomical Unitaround sun-like stars?assuming, of course, that they are present,? Kastingsaid. ?As such it will give us strong hints as to whether other habitableplanets exist.? Lookingbeyond Kepler and CoRoT, Kasting said what?s really needed is a combination ofspace-based astrometry and space-based direct imaging to find Earth-sizedplanets around nearby stars and to study them spectroscopically. ?A positiveresult from Kepler could help give us the momentum to get those missions funded,?Kasting suggested. The French CoRoTspacecraft is serving largely to whet our appetite for what Kepler willdiscover, said Alan Boss in the Department of Terrestrial Magnetism at the CarnegieInstitution of Washington in Washington, D.C.
Boss is theauthor of the newly published ?The Crowded Universe - The Search forLiving Planets? ? a book that points out that a ?new space race? isunder way. The winner will claim victory, he writes, by discovering howfrequently Earth-like planets occur in our neighborhood of the Milky WayGalaxy. Bosspointed out that the CoRoT spacecraft sports a smaller diameter (less thanone-third of Kepler), a smaller field of view for transit searches (about 20times smaller than Kepler?s), ?and has a restriction to staring for no more than150 days at the same stars versus at least 3.5 years for Kepler. All thatadds up to key facts: ?CoRoT is able to find a few hot and warm super-Earths,but not the habitable Earths that Kepler will discover,? Boss told SPACE.com. ?Kepler should also discover enough Earth-like worlds - probably dozens - toyield a good, statistically valid estimate of the frequency of Earths,? hesaid. ?CoRoT iswonderful,? Boss concluded, ?but Kepler will be ?wonderfuller!?? Meanwhile,hopes are high for Kepler here at the Boulder, Colorado-based Ball Aerospace& Technologies Corporation. Ball is the firm responsible for developing theplanet-hunting Kepler flight system and is supporting mission operations. Workingclosely with Ball in operating the spacecraft is a team of 20 students and 16professionals from the neighboring University of Colorado, Boulder?s Laboratoryfor Atmospheric and Space Physics (LASP). There were1,350,000 labor hours here at Ball, in-house, to build that machine,? said JohnTroeltzsch, Ball Aerospace Program Manager for Civil Space Systems. ?Kepler isa very unique NASA telescope in that we have a huge field of view,? he told SPACE.com. Troeltzschsaid that Kepler is ?perfectly optimized? to search forEarth-size planets in the habitable zone of their parent stars. WhileKepler is on tap for a three-and-a-half year prime mission, the hope is forextending its planet-searching duties. ?The longeryou go...the more science you?re going to get,? Troeltzsch said. ?We get upthere and we?re finding planets, there?s really going to be, I think, a lot ofcompelling reasons to extend the mission.? Predicted Troeltzsch:?I think we?re going to find a lot of planets. It?s going to change the waypeople think about space. And I also think it?s going to change the way NASA?stargeting future missions to do follow-up. ?